Spring is the season when this Venezuelan species bursts into flower! Spring is a particularly appealing time of year for those who grow the Cattleya species because several of the best species flower then. It is a time for Cattleya mossiae, Cattleya mendelii, and the charming Cattleya lawrenceana. It is also a time for one of the most beautiful and often overlooked members of the spring entourage, Cattleya lueddemanniana. Cattleya lueddemanniana is native to Venezuela, where it has always stood in the shadow of the grand and glorious national flower, Cattleya mossiae. Since it flowers at the same time as C. mossiae, C. lueddemanniana seldom gets the recognition it deserves. It is like a shy young girl who is always upstaged by her beautiful older sister. But C. lueddemanniana has several virtues that C. mossiae lacks. The most important one is its fine shape. Cattleya lueddemanniana has some of the best-shaped flowers in the whole Cattleya genus and, unlike C. mossiae, even everyday plants can have good form. Cattleya lueddemanniana also has a large number of dark clones, including some where the color has an almost iridescent glow, which is unique among the Cattleya species. 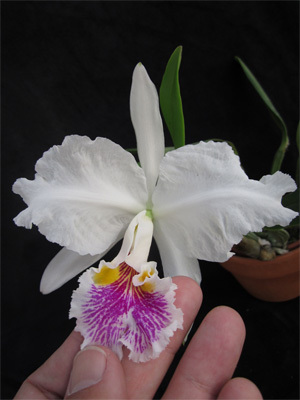 But none of the Cattleya species has had more trouble with its name than poor C. lueddemanniana. Its name was so little-known after its discovery that the plant was actually described as three different species and “Cattleya lueddemanniana” was the name least known of all of them. Eight years later, in 1862, Robert Warner saw a plant of C. lueddemanniana in the collection of a Mr. Dawson of Meadow Bank, near Glasgow, Scotland and, believing it to be a new species, named it Cattleya dawsonii. Cattleya lueddemanniana was a rare plant in cultivation after Reichenbach first described it. There were essentially no plants for sale until 1868 when Hugh Low and Co. in England imported a large number. 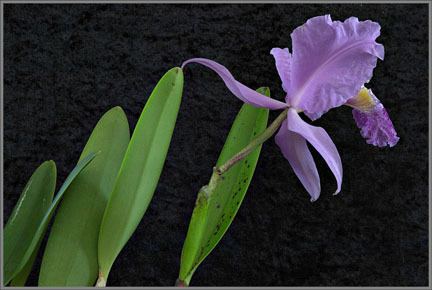 Neither Reichenbach nor Warner had known where the plants they described grew naturally, so when Low’s collectors found them in a newly explored area of Venezuela, Low treated them as a new species and a description was published in the British Gardener’s Chronicle under the name Cattleya speciosissima. Low’s large commercial supply of plants spread the name C. speciosissima with them over all of Europe, and for the next 100 years, C. speciosissima was the name most widely used by commercial growers and amateurs alike for C. lueddemanniana. The commercial orchid grower’s bible of the day, the 7th edition of Williams’ The Orchid-Grower’s Manual, doesn’t even mention C. lueddemanniana except to refer the reader to Cattleya speciosissima. But C. lueddemanniana’s troubles with its name continued, and the first C. lueddemanniana hybrid to flower was recorded as a C. mossiae cross by Mr. Dominy of Veitch, who raised it. Because C. lueddemanniana flowers at the same time as C. mossiae, but produces fewer flowers per stem than C. mossiae, it was not popular with commercial cut-flower growers of the 1930s and 1940s. 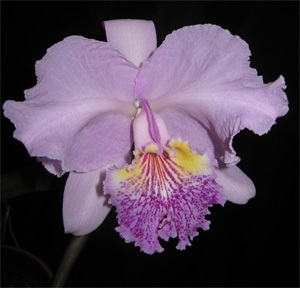 So, despite its abundance in Venezuela, it was never imported in the large numbers that occurred with C. mossiae and Cattleya trianaei. Cattleya lueddemanniana was looked upon by commercial growers as a minor species not worthy of much attention. J. Linden, in his magnificent five-volume orchid book, Lindenia, pictured only one C. lueddemanniana and even then he called it “Cattleya malouana.” Helen Adams, in her articles on the Cattleya species in the American Orchid Society Bulletin of the 1940s, never included an article on C. lueddemanniana although she included articles on virtually all the other important Cattleya species. In its native homeland of Venezuela, C. lueddemanniana grows along most of the north slope of the coastal mountains, the Cordillera de la Costa, from sea level to about 1,500 feet. From there it extends inland into the State of Lara at a slightly higher elevation. Plants in the two areas differ somewhat in color and size and some authors have considered them not only distinct types, but even separate species. The coastal C. lueddemanniana is generally larger, better-shaped and lighter in color, while those from Lara, the “Larense type,” are smaller and darker. Because of the abundance of the Larense type, C. lueddemanniana has more dark-purple clones than most of the other unifoliate Cattleya species, and this has had a significant impact on hybridizing over the years. It is the dark Larense C. lueddemanniana crossed with Laeliocattleya Callistoglossa (L. purpurata x C. warscewiczii) that gave us Laeliocattleya Lustre, which appears in the background of such outstanding dark hybrids as Brassolaeliocattleya Norman’s Bay, Brassolaeliocattleya Mem. Crispin Rosales and Brassolaeliocattleya Oconee. White clones of C. lueddemanniana have garnered their share of recognition, too. The Royal Horticultural Society has given them three First Class Certificates (FCC) and the American Orchid Society has given one. The first FCC was awarded by the RHS in 1892 to a “Sanderiana” clone. The flower was even pictured in the book Reichenbachia. A second FCC was given in 1898 to a plant exhibited by a W. Duckworth, Esq. of Manchester, England. A third clone, ‘The Queen’, FCC/RHS, is considered one of the best-shaped albas in the whole Cattleya genus. When I was a teenager, I remember seeing a plant of Cattleya Lady Veitch ‘Superbissima’ (C. lueddemanniana ‘The Queen’ x C. warneri), a magnificent, large, round white cattleya, and wondering why everyone thought Cattleya Bow Bells was so great. Cattleya Lady Veitch was much better. There are several fine semi-alba clones of C. lueddemanniana, among them ‘Margaret’, AM/AOS (1979), which has very good shape and ‘Angel Falls’, with unusually large size. A considerable amount of confusion, however, surrounds the great old semi-alba clone, ‘Stanleyi’, FCC/RHS (1901). J.A. Fowlie considers ‘Stanleyi’ synonymous with C. lueddemanniana ‘Schroederiana’, an earlier clone (1886), but this cannot be verified because there is no RHS award painting of ‘Schroederiana’. More serious confusion, however, lies with the clone ‘Cerro Verde’, AM/AOS, which has been meristemmed and widely distributed under the name ‘Stanleyi’, which it only vaguely resembles. ‘Cerro Verde’, AM/AOS, is one of the loveliest cattleyas I know. It has wispy lavender markings at the tips of the sepals and petals and along the edges of the petals that almost make it glow, and a rich, dark-purple lip that gives a good contrast. But it is not ‘Stanleyi’, which is dull by comparison. ‘Cerro Verde’, AM/AOS, is also a vigorous grower and is relatively easy to flower, which makes it a good plant even for beginners. A great many fine lavender clones of C. lueddemanniana exist and one of the very best is named for my father, ‘Arthur Chadwick’, HCC/AOS. This is an unusually large flower with exceptional shape and a large classic C. lueddemanniana lip. It was a jungle-collected plant imported in 1935. The most famous dark-purple clone is an old one named C. lueddemanniana ‘Ernestii’, FCC/RHS (1896), which The Orchid Grower’s Manual describes as “the finest variety of C. speciosissima we have ever seen.” Two of the best dark clones available today are Fennell’s ‘Jungle Treasure’, and ‘Stewart’s’, both of which have excellent dark color. There are also some good coerulea clones. The best-known is probably ‘Siquisique’, AM/AOS, which has very good shape for a coerulea, but it is not as “blue” as many other clones. In the trivia category, C. lueddemanniana is a candidate for the Guinness Book of Records with a plant that produced four lips on one flower (The Orchid Review, Vol. 7, page 292). Cattleya lueddemanniana breeds with C. mossiae in nature to produce a lovely natural hybrid, Cattleya xgravesiana. There have been some particularly fine white strains of C. xgravesiana produced by hybridizers over the years, but most seem to have been lost to cultivation. In summary, C. lueddemanniana is a distinct and lovely unifoliate Cattleya species that has never really enjoyed the recognition it deserves. Its greatest success since its discovery has been as a parent to improve the shape of Cattleya hybrids, but it is a beautiful flower in its own right with an iridescent coloring and charm not found in the other Cattleya species. So for once in your life, spend a little time with the younger sister. You may be surprised and pleased with what you find. CATTLEYA warscewiczii has the reputation as the Cattleya species that requires the most sun to make it bloom well, but the greatest sun-lover is actually Cattleya luedde-manniana. Unlike most of the other large-flowered Cattleya species, which grow at relatively high altitudes in the mountain valleys, C. lueddemanniana grows close to sea level in its native Venezuela. It grows where there is almost full sun, so it takes lots of sun for most clones to bloom well. English growers often consider it a shy bloomer, but under the hot, sunny conditions we have in the United States, it flowers freely. To bloom well, the leaves of a C. lueddemanniana plant should be a light green. With this much sun, you have to have plenty of moving air to keep the leaves from burning. Feel the leaves with your hand, and if they are warm, you must provide more air or more shade. Because it grows at sea level, C. lueddemanniana also likes a slightly warmer night temperature (60 F), than most of the other unifoliate species. Young transplanted seedlings will not tolerate cold night temperatures and I recommend a night temperature of 70 F if you want to avoid rot. These seedlings also like more sun than other Cattleya species. Cattleya lueddemanniana begins growing during the winter, and as soon as the new growth is mature, it sends up buds and flowers in March and April with no rest period. After blooming, it will usually make another growth that will not flower and the plant will then rest until next winter. Under low-light conditions, however, it can occasionally flower only on the second growth in September or October and not in the spring. While it is actively growing, C. lueddemanniana requires lots of water, but like other Cattleya species, it should be allowed to dry out thoroughly between waterings. If you are growing in a bark mix, C. lueddemanniana will benefit from a little light fertilizing while it is actively growing. One-quarter teaspoon of a 20-20-20 per gallon of water, using a cupful per plant once a week, is ample, but never apply fertilizer when the plant is dormant because this can damage and sometimes kill the plant. — A.A. Chadwick.